Penelope Wilhern (Christina Ricci), born to wealthy socialites (Catherine O’Hara and Robert E. Grant), is afflicted by the Wilhern spell that can only be broken when she finds love. Hidden away in her family’s estate, the lonely girl meets a string of suitors in her parent’s futile attempt to break the curse. Each eligible bachelor is enamored with Penelope and her sizable dowry … until her curse is revealed. REVIEW: Annie: So what are you hiding from the law or is it just a bad nose job? Bad nose job indeed. Poor Penelope (Christina Ricci) is born with a curse that was carried down through her lineage. Rich and educated, men are drawn to her charm but run from the sight of her nose, her pig nose. With a life full of pain from rejection and isolation, she tries hard to stay upbeat and persevere. This fairy tale (to continue to use my favorite word of the year so far) is really charming. No really it is. It’s one of those “awww, how cute” movies. It is amusingly funny with a hint of fantasy and a dab of romance and it will touch your heart. One of the overall themes of the film is acceptance which is what Penelope truly desires and needs. But this acceptance is not just from those around her, it is also from within. This darling movie is pretty much what I expected going in. It’s not the best movie ever, but it is a sweet, simple, well-presented story that is worth watching if you are in the mood for something like that. Watching Christina Ricci in this movie took me back to her days as Wednesday Adams. She was very cute in a quirky, twisted kind of way back then and she gives a similar effect in this role plus a heavy dose of sympathy that you feel toward her character. Christina does a wonderful job playing Penelope. You can’t help but fall in love with this character. She has an appropriate look for the part too with her actual little button nose on top of which the pig nose fit well. 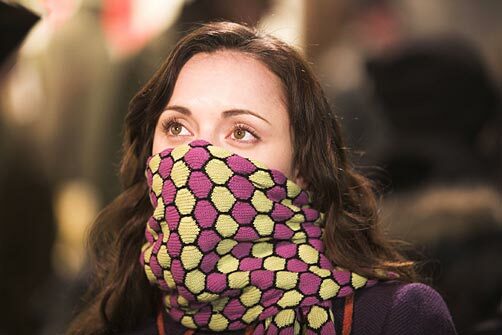 For her scenes with the scarf, her big, round, expressively penetrating eyes were just what the doctor ordered. I was almost thrown off guard by her performance due to it being quite the opposite extreme of her recent role in Black Snake Moan. Another honorable mention is James McAvoy who plays Max, who really isn’t Max, a would-be suitor to Penelope. James has been pretty busy lately. The first time I really noticed him was in Narnia as Mr. Tumnus and to be honest with you, I did not see this coming. He has, however, proven his talent and he deserves his recent demand and success. Remember that little guy in the movie Elf, the one that was a famous children’s book writer who beat up on Will Ferrell? Well, his name is Peter Dinklage and he’s in this movie too as Lemon, a feisty and determined reporter looking to uncover Penelope’s secrets. I was impressed by his genuine performance. There is a bit of hype regarding Reese Witherspoon’s presence in this picture which is uncalled for. Her role as Annie, someone who befriends Penelope, is way too small and thus her impact is not felt. Her role as one of the leading producers of this project, on the other hand, is noteworthy. The story line for this film is really simple but sufficient as you would expect it to be for a fairy tale. The script was just the same with some clever use of pig related lines and humor. The sets and cinematography were also simple but borderline cheap. The meat of the movie is found in Penelope and Max. Even though Penelope is a little disturbing to look at, you long to see her again whenever she is not on the screen. How Mark Palansky was able to pull that off in his feature film directorial debut is magical . . . and so is this movie.